No tracing. Pakistani artist Haider Ali makes the intricate art of truck painting look easy. For the last few weeks, Karachi-based artist Haider Ali been working around various spots in southern California, mostly in the parking lot of his hosts at the USC Pacific Asia Museum at Los Robles and Union in Pasadena, spiffing up a Ford cargo van. 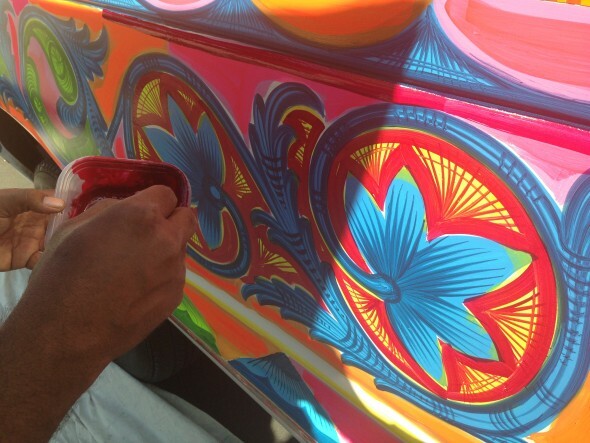 In his native Pakistan, Ali is one of a handful of prominent truck artists who do brisk business around the country. 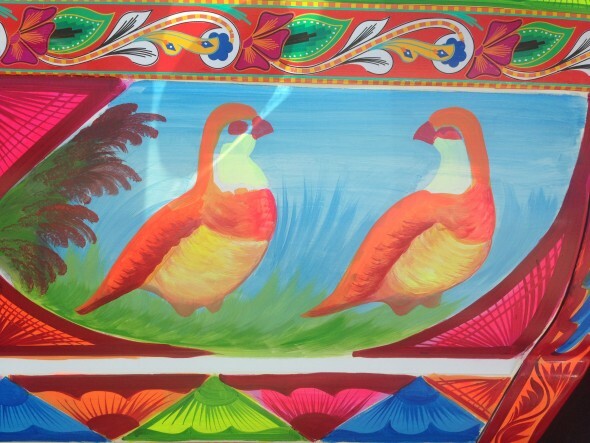 India, he says, has Bollywood; Pakistan’s big, lucrative creative industry is truck art. He himself makes an excellent living elaborately painting and otherwise decking out trucks, far bigger trucks than this one he’s embellishing. It’s an art form and trade he learned from his father when he was a kid. In Pakistan, having a colorful truck isn’t a luxury: It’s considered standard. The practice dates back to the age when camels were the typical mode of transport, Ali told me through a translator; missing their wives back home, they’d beautify their caravans. Now, this form is a way of peace: A way to show the world another side of Pakistan. And, he said, it’s good for the economy. A dozen years ago, Ali made his first trip to the US-to paint on the national mall as part of the Smithsonian Folklife Festival. He says a big part of the skill is interpreting the personality of the client, reflecting that onto the vehicle. That’s what makes it different from just painting on any old canvas, where the artist is in control of the work. Ali’s done with his work here and headed back home, but perhaps you can see the van he left behind, buzzing around Los Angeles courtesy its owner, Shahnawaz Restaurant in Lakewood. His residency here was part of the larger LA Islam Arts Initiative that launches this week and continues through the end of the year, the centerpiece of which is a show at the LA Municipal Gallery of tobacco heiress Doris Duke’s Islamic art collection.